Ecommerce Mastery Live (ECML) is an offshoot of the iStack Training&#x27;s wildly successful Facebook Ads event, Facebook Mastery Live.InBarcelona we are laser focusing on Ecommerce by preparing a whole day of leading-edge, directly applicable, high level training for ecommerce entrepreneurs. Whether you are building a drop shipping store, a high-performance brand, or a standalone Facebook campaign for a CPA product, ECML will provide you with dozens of tips, strategies and tactics that can 10X your business.Thisfull day training event brings together some of the world’s top ecommerce minds, like Mohamed Ali Aguel, Steve and Evan Tan, Nick Peroni, Tim Burd and many others. 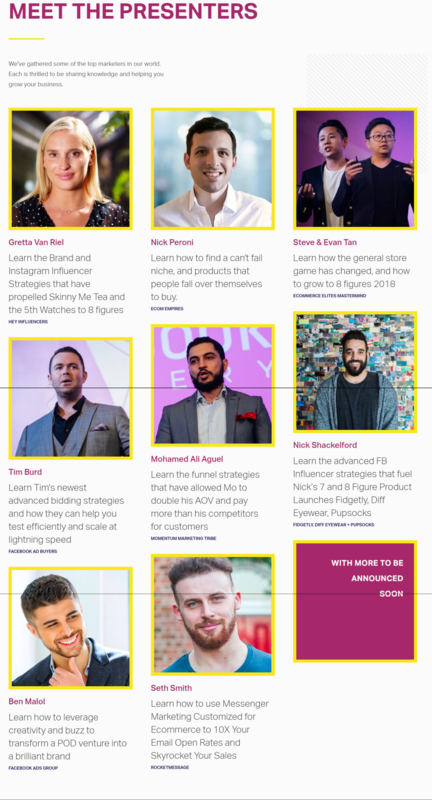 Each speaker will bring their unique perspective on building ecommerce businesses, touching on topics like product research, product selection, outsourcing, warehousing, fulfillment, funnels, upsales, influencer strategies, Facebook Ads, Native Ads, affiliate growth strategies, and LOTS more. Within 24 Hrs after payment. INBOX me Directly for Payment link!